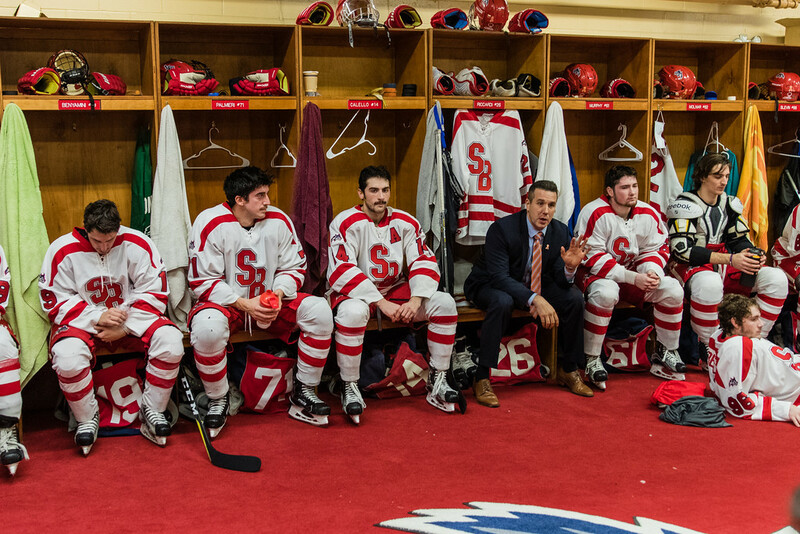 The Stony Brook hockey team has been given an unexpected bye week and two 1-0 victories after Syracuse University’s decision to suspend its men’s hockey team. The suspension comes in the wake of a fight between Syracuse players and New York University fans following a controversial overtime win for NYU at Chelsea Piers last weekend. Syracuse University made the decision to suspend all team activities for the remainder of the 2017-18 season after a video of the fight was tweeted by Barstool Sports, a sports media company. Stony Brook, who was scheduled to play two games at Syracuse this weekend, received an important four points in the standings in conjunction with the forfeit victories. While the points will help them in the Eastern States Collegiate Hockey Association standings, the “victories” will not affect the Seawolves in the American Collegiate Hockey Association national rankings. There is a chance that the Seawolves may move up slightly in the rankings based on the play of other teams, but Garofalo does not expect them to get hurt. Stony Brook will head to NYU this Friday when it returns from its unscheduled bye week. In the wake of the melee with Syracuse, the ACHA and NYU have set up new parameters to prevent a repeat of last Saturday’s events. In addition to the change of locker room, Chelsea Piers will have added security at the game and will not allow fans to bring alcohol into the arena. The presence of alcohol has been a noted problem at Violets games. The Seawolves’ four points from the Orange has ensured that the Violets cannot catch them in the race for second place in the ESCHL regular season. Liberty has already claimed the top spot, leaving Syracuse and Stony Brook in the running for second place. If Syracuse’s suspension is upheld, however, the team will not finish higher than third. Stony Brook will be at Chelsea Piers Friday, Feb. 9 at 8:30 p.m. for the first game of a home-and-home set against NYU before returning to The Rinx in Hauppauge on Saturday for the team’s final home game of the season.